B.io is a new and unique platform where your biography is hosted, updated, translated. Whether you are an individual artist, writer, scholar, speaker, or an agency, press company, record label, theater, or academic institution, a professional team of writers and translators ensures the facts of your life, or those of your clients, are told in the best way possible. B.io offers you a well-written biography that is always up-to-date, in all the languages you need. Simply create an account, upload your materials, and request the services you need: ghost-writing, revision, translations. Update with new information any time, to be incorporated and translated by our team in real time. B.io is a unique hub where you can tell the world about yourself. This is not another site for your CV, but an online encyclopedia of people. Anyone who needs your biography can find it here. No need for emails. B.io cuts the fuss. Tell the world your story and then update it easily, any time. Your B.io can include different lengths or types of biography. Longer and shorter versions, different styles. Simply store and update them all here. Our team of translators (never bots) can translate your B.io into a wide range of languages. Whenever you update your biography, translations and alternate versions will automatically update too. B.io enables you to store and collate vital information, hassle-free. You can incorporate your story into other projects with ease. You have control. B.io: Making sure your story is told the way you want it to be told. Agencies and Institutes: Manage your roster’s biographies. Promoters: Access the biographies your company needs. Our team of translators (never bots) can translate each B.io into a wide range of languages. Whenever a biography is updated, translations and alternate versions will automatically update too. Make your edit once, leave the rest to B.io. B.io is not another site for CVs, but an online encyclopaedia of people. 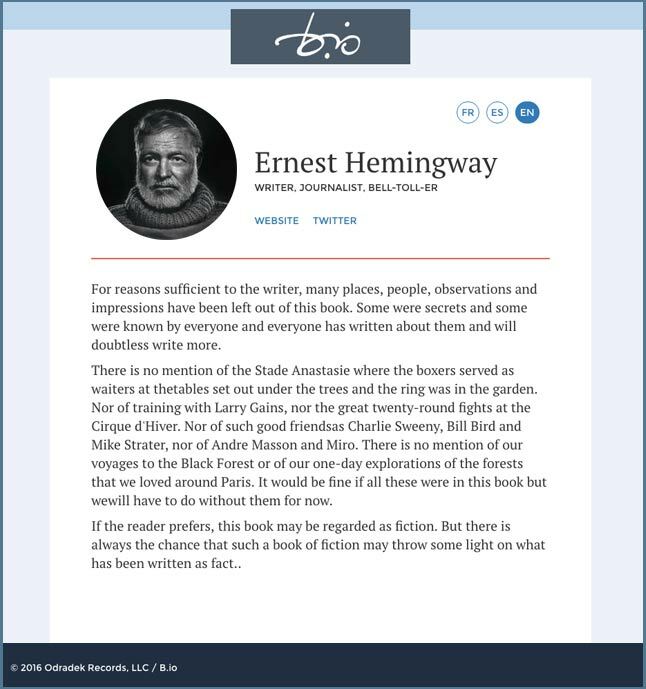 Whether you’re working with artists, authors, speakers, scholars, composers, or other notable persons whose story needs to be managed, B.io will streamline your workload. B.io offers different lengths or types of biography. Longer and shorter versions, different styles. So whatever version you need, it’s available immediately. No risk of conflicting versions of the story. B.io cuts the fuss, and your stories are always current. B.io: empowering you to store, collate, and access vital information, hassle-free.